Please select dates and click "Search" button to find available room in Amstel Botel. 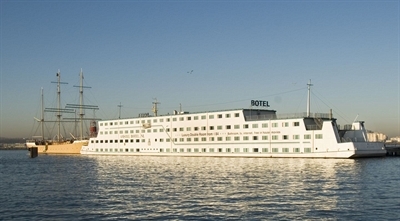 The Amstel is a floating hotel located at the opposite of Central Station, which is just 18 minutes away from the airport. All major attractions and shopping areas are within walking distance. The Amstel Botel is simply a perfect location to stay. By public transport: You can reach the hotel from the back (north side) of Amsterdam Central Station. Over there you can take a free ferry (NDSM werf) that will take you to the Amstel Botel in approximately 10 minutes. At night and early morning, when the ferry is not running, the hotel has their own free shuttle bus at night, clearly marked, that will take you to and from the Amstel Botel. By car: On the ringroad A10, take exit S118 direction ”Tuindorp-Oostzaan”. At the crossing turn left and at the traffic lights turn right on the ”Molenaarsweg”. The “Molenaarsweg” will continue into the “Cornelis Douwesweg”. You will pass 2 roundabouts and at the traffic lights you go straight ahead on the “Klaprozenweg”. Now take the first street on your right, the “van Riemsdijkweg”. From here, continue straight ahead in the direction of the water to the “NDSM-Pier” where the hotel is located.